•Snapping is the process of moving one feature exactly to the location of another within a specified search distance. The computer snaps features for you, you simply move the vertex near the other feature you want to snap too. •To be able to use snapping you must set the snapping tolerance, this is the search distance around the vertex you are moving. Set it too high and your vertex could snap to any one of its surrounding features; set it to low and it will not snap to anything. 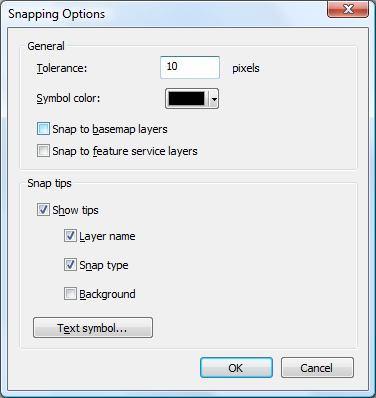 •To alter the snapping tolerance go to Editor > Snapping > Options... on the Editor tool bar. Ensure the Enter a value in the tolerance text box. You can also alter the symbol colour and snap tips. 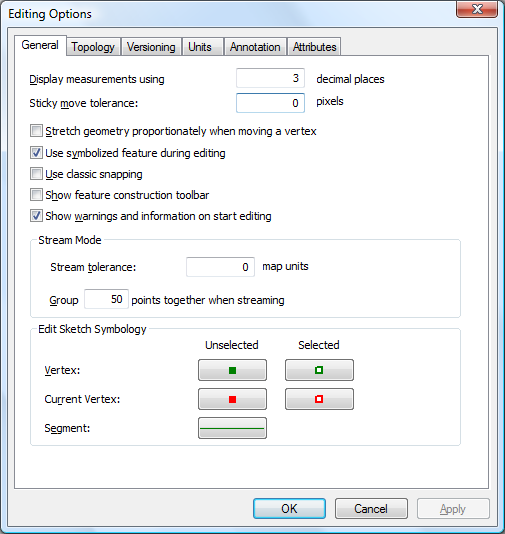 • When you start editing and snap a polylines vertex to another feature you will see the snap tip appear telling you what type of snap is occurring. In the image below the word Rivers is the name of the FeatureClass that is being snapped to and the word End indicates the snapping type occurring is a snap to the end as opposed to vertex or edge snapping. •Snap tips clearly aid the user by confirming exactly what they are snapping to! •Sticky tolerance avoids the problem of accidentally moving the whole polyline when you really wanted to move a single vertex! •Setting a tolerance value in screen pixels means that if you click on a polyline and move the whole polyline less than the tolerance distance you set then the polyline will jump back to it's original location. •To enable sticky tolerance go to Editor > Options... on the Editor tool bar. Ensure the General tab is selected and enter a value greater than zero in the Sticky move tolerance text box. •Use the correct snapping environment to ensure you are snapping correctly. Remember the golden rule for networks is that polylines must join each other at their ends. •The snapping environment is set from the Snapping Tool bar. Go to Editor > Snapping > Snapping Tool bar. From here you can press the buttons to to say what you want to snap to. 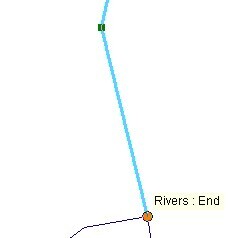 If you are editing a river network then you are most like to want to snap to ends of polylines and nothing else. The tool bar below has been set to snap to ends only. •This setting ensures snapping is only applied to the end vertices of a polyline. 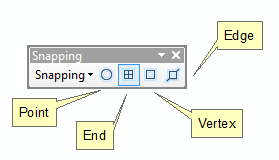 ArcMap will not snap to the polyline edge or non-end vertices as you have not ticked the other check boxes. •This setting is particularly useful when creating a new polyline or adjusting an existing but incorrect confluence as the snapping rule enforces the golden rule of all polylines must join only at their ends.